I bought a High Caliber Sales (HCS) MK12MOD1 upper and I had hoped that I would be writing a grand review of it by now. Unfortunately Kevin of HCS sent me a badly screwed up upper. To back track for a moment. 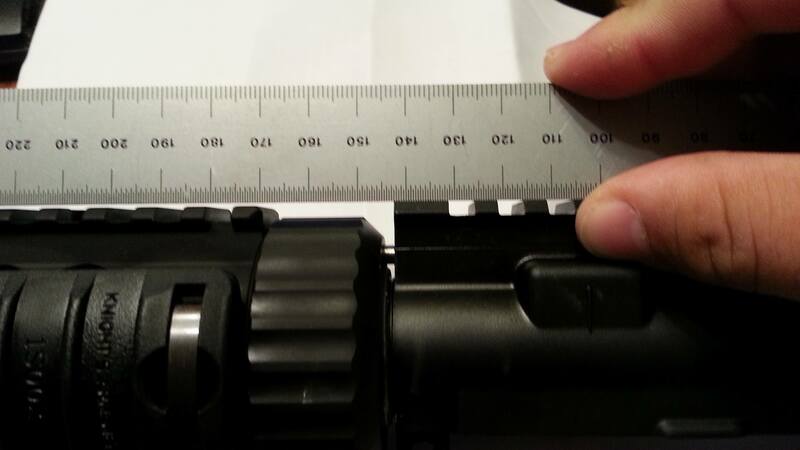 The Special Purpose Receiver (SPR) was a 18 inch barreled “sniper” upper for the SOPMOD M4. After finding issues with the carbine length recoil system and the rifle length gas system of the upper, the SPR became a complete rifle issued as the MK12MOD0. Later to simply production, lower costs, and lighten weight, the configuration as changed to the MK12MOD1. The MK12MOD1 is most notably associated with the Navy Seals. The U.S.M.C. also issued limited numbers of them, and a few have been seen in the hands of U.S. Army Rangers. It appears that now the MK12 is being phased out of service. When they were adopted, no provisions were made for maintaining them, and many unit commanders don’t seem to see the benefit of a more precise rifle in the unit capabilities. Despite the MK12 being used less in the military, it has a growing cult following. MK12MOD0 clones use some discontinued hard to find parts, so people seek them and have driven the prices up on them. Even parts like the Knights Free Float RAS and proper profiled barrels are hard to find for the MK12MOD1. I’ve wanted a MK12MOD1 upper for a while, so when I found one for sale used, I picked it up. Sadly this HCS upper I purchased used got damaged in the mail. Marcus Luttrell (Lone Survivor) can fall down a mountain with his and it can be fine, but when I get a MK12 it doesn’t survive the trip through USPS. So the seller worked out a deal where this upper would be sent back to HCS and they would fix it. At HCS, Kevin tightened down the rail, and reindexed the muzzle break. 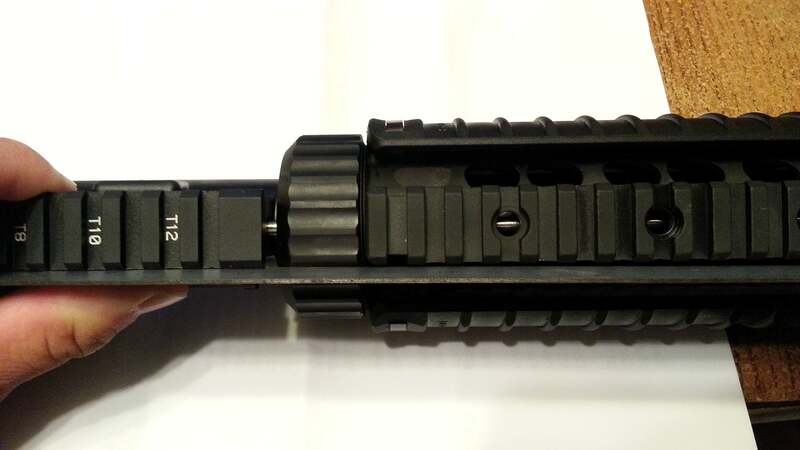 When I received this first upper back I was dismayed to find that the rail was still crooked to the upper and barrel. 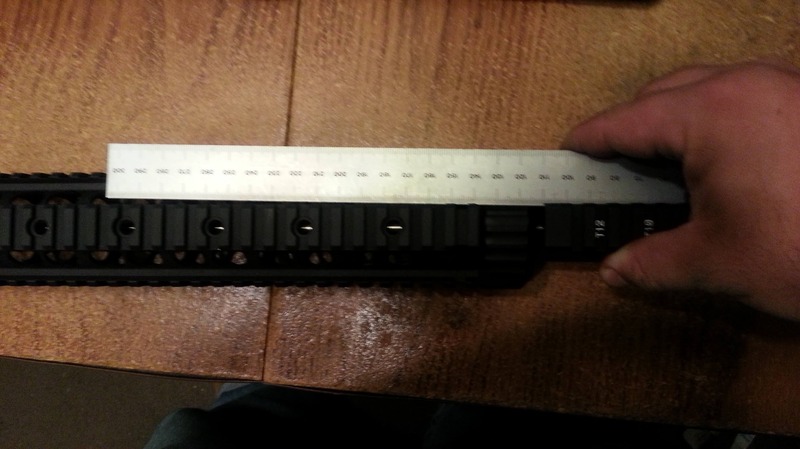 Above is a poor photo showing how the rail is not in alignment with the upper. So I decided I would purchase a brand new upper from Kevin at HCS. This rail is so crooked that my irons sights do not have the adjustment to be zeroed on this upper. 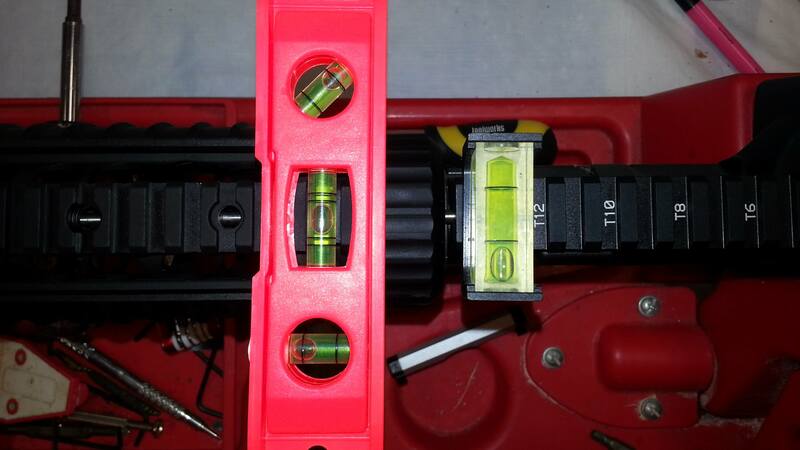 The last little kicker is that Kevin supplies a bolt carrier group with a non-staked gas key. The Young mfg BCG do not come with a staked gas key, and last I heard staking your gas key on one voided your warranty. Having talked to Kevin about these multiple issues, I get the impression that he finds it acceptable. I first received the used upper back from Kevin with a crooked rail, then I received a new upper from Kevin with a majorly fucked up rail installation. Having posted this on the firearm forum AR15.com, I found that I was not the only one with these issues. This upper is going back for a refund. If you want to buy a MK12MOD1, don’t buy it from High Caliber Sales. Shouldn’t it be “large caliber”. Holy crap. Thanks for the warning. No MK12 in my immediate future, but this is enough to make me want to steer clear of High Caliber Sales for any transaction. I’ve always said that the guys at Loose Rounds call it like they see it, and I love them for their truth and honesty. In 2013 I purchased a SR25 upper from them. After waiting 8 months to get it. 10 rounds threw it…. And it was sent to me with the barrel nut not tighten down. Buying the upper was not cheap, when I confronted Kevin at high caliber sales. No help was offered, said it was impossible for it to loosen up. Please for my sake spent your money els where! My story is that I bought a mk 18 mod 0 upper from them. It’s fine and has served me well, but it’s a simple upper and honestly it’s pretty hard to f*** up. BUT I bought a Mk18 mod 1 upper from them after, and instead of the LMT upper receiver and LMT 10.5 barrel, it came with a COMMERCIAL upper (complete with rails out of spec so everything fits tight on them) and Daniel Defense barrel (which looks like it was cut down). Basically he swapped out cheaper parts and hoped I wouldn’t notice. But I did and confronted him about it and he offered to swap out the upper, but I’m not going to pay shipping to send a purchase back to a guy I don’t honestly trust. So I took the loss and won’t be buying anything else from them.